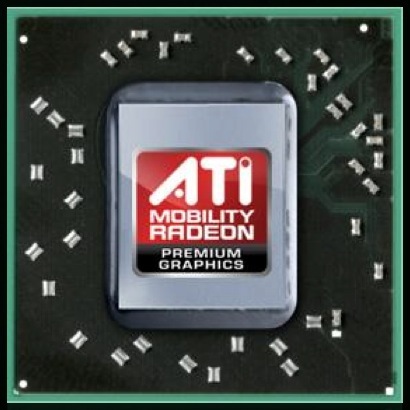 The ATI Mobility Radeon HD 5850 is a high-end DirectX 11-capable graphics card for notebooks by AMD based on the desktop HD 5770 (RV840) chipset. Essentially, the HD5850 is a Mobility Radeon HD 5870 that has been underclocked by about 11 percent. In contrast to the HD 5870, the 5850 is sometimes equipped with slow DDR3 graphics memory. The memory interface of the Mobility 5850 is composed of two 64 bit wide controllers leading to a 128 bit memory bus that can access up to 1024 MB of either DDR3 or GDDR5 memory (or even up to just 512 MB of G=DDR3 in lower-end models). If (G)DDR3 is used by the laptop vendor, then the performance of the 5850 will suffer by a noticeable margin. The 5850 offers 800 MADD cores (called Stream Processors) that are grouped in 160 5-dimensional groups. The cores support DirectX 11 functions in hardware (e.g., Tessellation, OIT, Post-Processing, Shadows, HDR Texture Compression). Furthermore, 16 ROPs, 40TMUs, and 40 TAUs can be found on the chip. All in all, the 1040 Million transistors offer a theoretical computation power of up to 1.12 TFLOPS. According to AMD, the HD 5000 series has improved general computing algorithms that the HD 4000 series lacks. Therefore, the performance of applications such as ATI stream, OpenCL, and DirectCompute 11 should be significantly better. The 3D performance of the Mobility HD 5850 depends heavily on the used graphics RAM, or VRAM. As long as fast GDDR5 is used, the performance should be between a GeForce GTX 260M - 280M in the high end segment. Therefore, all current games as of 2009 should be playable in high details with high resolutions. With DDR3 memory, however, the performance should drop noticeably because of the relatively narrow 128 Bit memory bus. In fact, the GDDR5 version (on par with a GTX 285M) is about 40% faster in the 3DMark Vantage benchmark than the DDR3 equipped version (on par with a GTX 260M). Exactly which games can or cannot run fluently on the 5850 can be found on the lower section of this page. The Mobility Radeon HD 5000 series includes an improved video processor (UVD2) to decode HD videos with the graphics card. The new version is able to decode two HD streams simultaneously (e.g., for Blu-Ray picture in picture), given that the graphics card offers enough memory bandwidth. As a result, it is entirely possible that only AMD GPUs paired with GDDR5 VRAM can decode multiple HD streams in parallel. Beginning with Flash 10.1 Beta, the 5000 series has also been able accelerate Flash HD videos such as on YouTube. As with the desktop HD 5000 series, the Mobility HD 5850 also supports Eyefinity to connect up to 6 monitors to the graphics chip. Of course, this depends on how many native monitor outputs the laptop vendor adds to the laptop (and how they are wired). Still, according to our sources, the laptop would specifically need DisplayPort outputs for Eyefinity to work, which, as of this writing, is only available on the HP Envy 17. Furthermore, the 5850 chip should support PowerXpress (with AMD chipset) and Switchable Graphics (Intel) to switch between the dedicated and chipset / CPU graphics card. Due to the high power consumption of the Mobility Radeon HD 5850 (40-60 Watt of the 5800 series), the GPU is only suited for large laptops with high-performance (and possibly loud) cooling solutions. According to AMD, the performance-per-watt ratio and the idle power consumption have both been improved thanks to Memory Clock Scaling and Clock Gating. Compared to desktop graphics cards, the Mobility Radeon HD 5850 should perform slightly slower than a Radeon HD 5750 due to the slower clock rate found on the mobile AMD GPU.